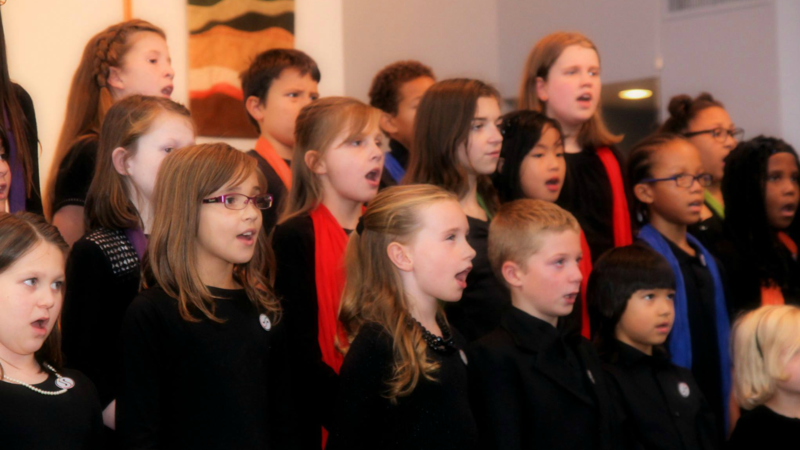 What Does Accessibility Mean for Children's Choirs? Amanda Stevenson became passionate about equity and access to music education while working in high-poverty schools in Des Moines, Iowa. In 2014, her family moved to Omaha. Wanting to get involved in the musical community there, Amanda searched for a children's choir that worked with students in urban areas and was both accessible and equitable... but she struggled to find one. So, like any highly passionate person does, in 2015, she decided to create her own organization that truly was accessible for all children in the Omaha area - the Omaha Children's Choir. As Founder and Managing Artistic Director there, Amanda works to ensure that every child in Omaha has access to quality music education. 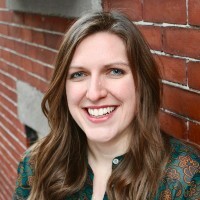 "There are multiple barriers that challenge accessibility in choirs - financial, geographic location, transportation, and language are just a few examples," Amanda says. "In the choral world, we often say that everyone has a voice but we don't always practice what we preach. You can be in choir if you make a certain amount of money, or if you live in a certain area, for example. And sometimes we don't see that there are real barriers." Understanding the barriers is the first step. Then, choruses can find solutions to address them. "Omaha is not a transportation-friendly city if you don't have a car. That's something we are constantly thinking about," Amanda says. "We try to be very strategic about the neighborhoods we veer in." Omaha Children's Choir currently rehearses in North Omaha and has decided to add a second location in South Omaha. "Ideally, we would like to be in every community. We can't feasibly have ten locations now while the organization is so new, but the model [of having rehearsals in every neighborhood] will help alleviate the accessibility gap," Amanda claims. As the organization grows, another idea is to have a vehicle to take singers from their homes/school to rehearsals and back. In the meantime, Amanda is excited to use Chorus Connection for Children's Choirs to help parents/caregivers plan carpools together. "In South Omaha, there is a large latino population so we are currently working to add Spanish to our registrations forms as well as our other marketing materials," Amanda states. She wants to ensure that all students have representation in the choir and would eventually like to translate all of their materials into other languages as well. She says, "We already have four languages represented in our choir, though most students who do speak languages other than English at home are bilingual and speak English as well." Language barriers can be hard to overcome, especially if choirs don't have the tools or funds available to help them manage translations. But if your choir wants to truly be accessible, working towards eliminating language barriers is an important step. In addition to translating any print materials, choruses may also consider hiring translators or asking for volunteer translators at rehearsals. Omaha Children's Choir makes it very clear on their website that "no child will be excluded from participation due to financial reasons." Their tuition is tier-based by income giving the option for low-income houses to pay less. They also offer multiple payment plan options where no one is charged more to be on a payment plan. And finally, registration forms for the chorus include a section for requesting scholarships if the family is unable to pay tuition. Amanda states that "65% of [their] singers receive some sort of scholarship." Apart from paying tuition, there are other barriers for low-income houses, such as access to internet. "Though our registration form is online, we always have paper forms available for people who don't have internet as well as on-site registration," Amanda says. "In addition to sending group communications online through Chorus Connection, we also use a texting service called 'Remind' as we have found that all of our families have phones and can text." Amanda realizes that not every family can commit to bringing their children to weekly rehearsals for a year-long choral program, but she wants to ensure that those children still have access to music education. So, she created the Omaha Children's Choir Summer Music Camp. "The camp is every day for an entire week. We always have some type of theme - last year's was 'music around the world,'" Amanda says. "During the week, the students participate in different musical classes such as music production and composition, world drumming, Orff/Kodály/Dalcroze methods, and dance/movement." The camp has about fifty children in attendance and has the same no-exclusion policy based on what families can pay. The full program tuition is $150 for the week which includes musical classes, lunches, t-shirts, and more. They ask that families pay a minimum of $35 for the program but will waive the fee if families are unable to afford it. The staff works to obtain donations for the event in order to keep the program as affordable as possible. 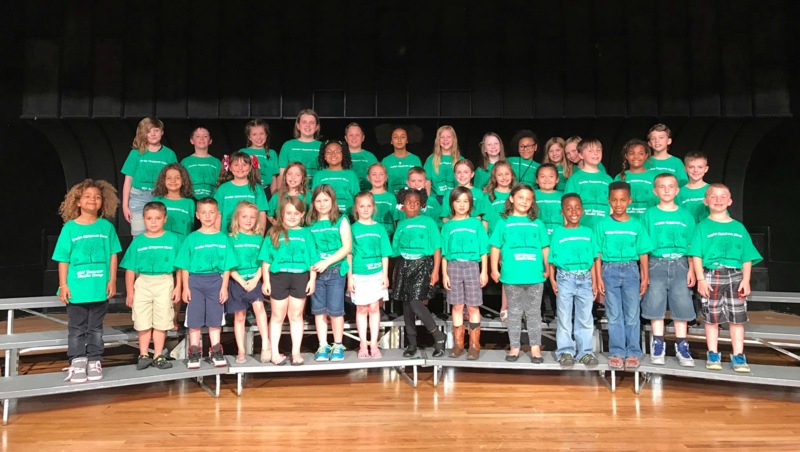 In addition to the summer camp, Omaha Children's Choir offers the one-day City Voices Elementary Choral Festival. Students can experience for one day what it is like singing in a chorus without the long-term commitment. "They don't need to learn the music beforehand. They show up, learn everything in one day, have lunch, grab a t-shirt, and perform a concert at night," says Amanda. Last year, the festival received a grant from a local arts council making it possible for children to attend the event for free. Forty children attended in the first year and Amanda hopes to grow the program more in the coming years. 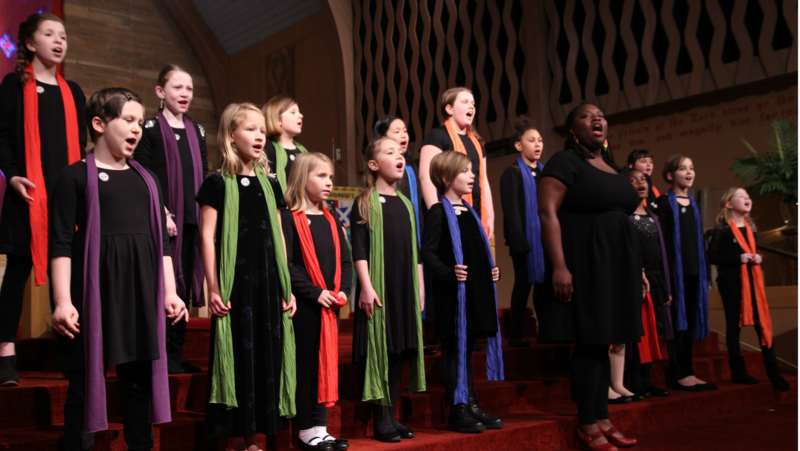 The Omaha Children's Choir mission is two-fold: 1) to be accessible and 2) to inspire social change in the community. 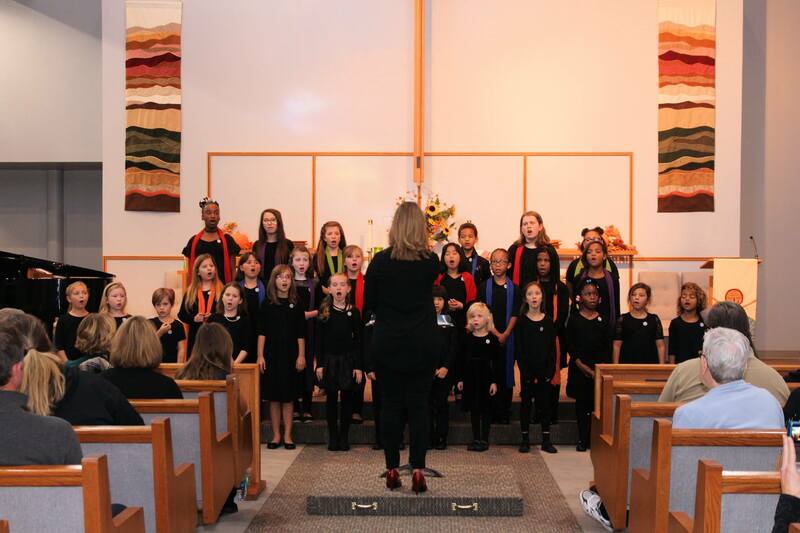 After their first year, Omaha Children's Choir decided to implement a "Voices Creating Change" program where they partner with local nonprofits that directly benefit the community and help raise money for that nonprofit. "We host a local event that educates the community on the nonprofit and the important work they are doing," says Amanda. "We typically do some type of panel discussion, show a film, and/or present a concert that helps tell the nonprofit's story. All proceeds from the concert go to that nonprofit." She continues, "The Voices Creating Change program helps give a voice to issues that are kind of voiceless in a way or are not well known in the community." To date, Omaha Children's Choir has raised nearly $6,000 for local nonprofits and have benefitted a wide range of causes such as preventing human trafficking, addressing internet safety, and educating the community on lead poisoning (a common issue affecting Omaha). In upcoming social change projects, the Omaha Children's Choir will partner with Opera Omaha to commission a two-part piece for children's choirs focused on addressing children's issues. Omaha Children's Choir is also planning to make a bold statement with their programming next year. They have decided to program only music next year from underrepresented populations such as women, the LGBTQ community, immigrants, and people of color. Amanda says, "It is important that our singers, their cultures and identities, are represented in the music we sing. Representation matters." Thank you to Amanda Stevenson and the Omaha Children's Choir for this post! To learn more about the Omaha Children's Choir, visit their website, like them on Facebook, and follow them on Twitter.